Quizzes are highly engaging and compelling way to connect with people and let them express their opinions. If we go behind numbers, then 6 out of 10 viral posts on the Buzzfeed are quizzes. Moreover, you don’t have to worry about SEO (which is a daunting task) as most of your visitors will be from Social Media Channels. Starting A Viral Quiz Site is not as difficult as you always imagined and believe me it will take only 10 minutes before your site goes live and your followers start visiting it. Wondering, where do I start? Let’s do it together one step at a time. Affiliate Disclosure: The article contains affiliate links. It means that I’ll get a small commission if you buy any linked product at no extra cost to you. Thanks for supporting this blog. First of all, you need to buy an attractive domain name. If your domain name is easy to remember and stick to the mind, then you would save yourself tons of time in promotion. Brainstorm few names and write them down. If you’re not able to brainstorm then, there are many domain name suggestion tools available on the internet. Use any of them to find a brandable & catchy domain name. Make sure your chosen domain name is available with COM extension as it is the most popular one and often get priority in search engine results. Now as you have a catchy domain name, it is time to choose a web host that can handle massive traffic (I’m talking about thousands of page views) in a single week. If you have read my previous guide about starting a blog, then you may have observed that I recommend Siteground Shared Hosting for new bloggers. Siteground is undoubtedly most user-friendly and preferred web hosting for beginners. But this time, I am not recommending it. Why? The answer is simple. Siteground is ideal for beginners who are out to start a personal blog or Adsense site to make passive income. While starting, they would not expect thousands of flocks on site and it may take months to reach thousands of unique visitors. On the flip side, a quiz site with proper techniques can easily get thousands of daily visitors. 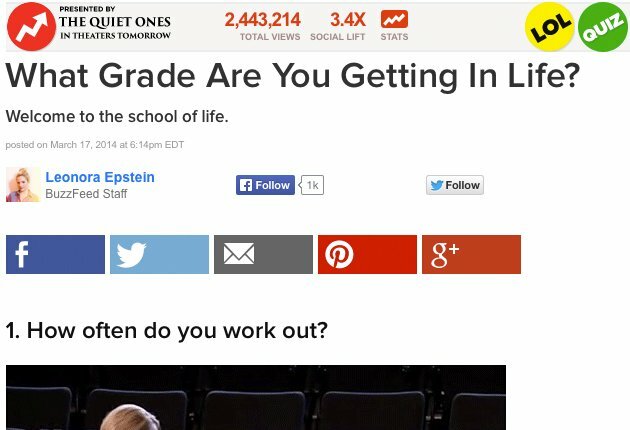 And once your article goes viral you’ll see 10’s of thousands of people taking your quizzes. Shared hosting can hardly handle 100 live visitors and thus it is not recommended. But cloud hosting from SiteGround is a way to costly and advanced level for beginners. So what web host do I recommend? I recommend VPS Hosting from InterServer or cloud hosting from Cloudways. With InterServer, you can get started for as little as $0.01 for the first month (use coupon code BLOGCHARGE) and see if launching a viral quiz site is a perfect fit for you. Basic VPS plan starts at $6/month, and you can add more slices based on your requirements. So once you have bought web hosting from InterServer or any other vendor, it’s time to install WordPress. Why WordPress? Because it is the #1 blogging platform with tons of features and easy to use interface which makes blogging easy. Plus the theme and plugin I am about to discuss are designed for WordPress only. Installing WordPress is just a click away from your CPanel dashboard. You just have to choose your website, give it a heading and description, click next, next, and next till you see your WordPress dashboard. Once you have set up WordPress on your host here are 3 important things to do. You can’t afford to skip these. Next is time to design your website. There are tons of paid and free themes available for WordPress from different vendors. MyThemeShop is my recommended choice for buying Themes and Plugins. You can either opt for a paid premium theme or a free one. For a premium, I would suggest any theme from MyThemeShop or Genesis framework with a child theme. For the free option, Viral Theme will be the best bet. Create a free account on MyThemeShop and download the zip file. Upload it to your WordPress site and boom! You got a beautiful website ready. You can customize your theme through theme options by going to theme > theme options. If you’re looking for other options, check out top 10 WordPress themes. So now you have a beautiful website with a catchy name hosted on a high-quality web server. Now is the time to turn it into a Viral Quiz Site. For this functionality, I will use WP Quiz Pro WordPress plugin from MyThemeShop. It is a paid theme which costs $29 (limited time discount). There’s a free version available, but it has less functionality as compared to paid one. I would recommend you to buy the pro version which will save you from doing manual work. Similar to the theme, download, install and activate WP Quiz Pro plugin to your WordPress site. To add a quiz, go to WP Quiz Pro > Add New and choose the type of quiz you would like to create. The instructions are quite easy to follow, and you can always ask for help to MyThemeShop support team if you want any extra changes. When you’ve created your quiz, and it looks good, you can display it anywhere on your post or pages using the shortcode provided. As I said earlier, highest traffic sources for you will be popular social media channels like Facebook, Twitter, and Pinterest. If you already have an active page with few thousands of followers, then your site will rock from day one. Else, you may have to wait to gain followers before your quizzes can go viral. You can also invest in Facebook ads to boost your reach and gain new followers. Last month, I spent $10 on Facebook to gain 46 new followers and 16000+ reach. Moreover, I got $13.33 affiliate commission from MyThemeShop. It was my first time using Facebook Ads without following any proper guide or case study. Pinterest traffic is mostly from tier 1 countries, and most of the users are females. So, if you’re creating quizzes for women’s, then Pinterest will be your ultimate weapon for traffic. Create new quizzes, promote it, get traffic, show ads, and earn money. You can automate most of your work by hiring VA’s and using social media automation tools. This way, you can create a viral quiz site as a side experiment while working on your current project. Note: Once your blog has good traffic and is at least one month old, you can Apply for Adsense or similar ad networks. If approved, place ads on your site to make money from your visitors. If not, wait for more time, improve the quality of your site, and apply again. Learn more about creating an Adsense Optimized Blog. What do you think of quiz sites? Are they worth the time spent? Let me know if you’re planning to create a quiz site using WP Quiz Pro plugin and I might link your blog on this page as a demo site. Both ways, do add a quick comment below. Feel free to tip me and help to make this guide more informational. Share this post with your friends and followers. Who knows, they might want to start a viral quiz site? Do you have any suggestions on how to make my quiz viral? You can promote it on related FB groups with a catchy title. Don’t promote it as your own site, just say that you got “this” result and it was so close to my personality. You guys should check it out too. Alternatively, you can promote it via paid FB ads. Hey, nice tutorial. But i not sure you used WP Viral Quiz or not, this is a free plugins. My problem is, when i insert google adsense in the plugins, it don’t show up. I have check the code but the adsense code (which insert for WP Viral Quiz ) is not running. But my other adsense (place in theme) is working well. Do you have any ideas what’s happen on it? Hi, I have same problem about insert adsense code in the Quiz. No, you can’t use the plugin on free blogspot site. You should be ready to invest in the beginning. Is these quizzes still working to bring viral effect? Yes they do if you can create interesting quizzes and get people to visit the site. Facebook and Instagram pages would work well with this method. I never thought that I will find a guide about Quiz site making. Love the in-depth article you gave! But I was wondering would a quiz website be approved by Google when applying for adsense? Since there isnt any content there so Im not sure if the site will be approved. What are your thoughts on this? Looking forward to your reply! Quiz site do get Adsense approval if they are of good quality and doesn’t have irritating popups. While uploading a new quiz, try to add 100-200 words explaining the quiz. You can take a look at https://www.sporcle.com for inspiration. First time here. I found you in inbound.org platform. this the great stuff. Great tutorial Shafi brother, starting a quiz site is the dream of many bloggers but they find it hard to implement. Your tutorial is super easy to make one quiz website easily. Thanks for such a nice post, newbies will bless you. Glad you found this article helpful. Keep visiting. You have brought up an interesting topic here. People should start a quiz site. I have noticed many websites are using the survey option to gather the info from their readers. The web hostings like Siteground would be better for any kind of blog. You’re correct Ravi, people should also consider, quiz sites to make money and collect subscribers. Regarding SiteGround, it can handle a good amount of traffic, but VPS hosting is much better for quiz sites.